I found a recipe in Olive magazine that looked and sounded utterly gorgeous. 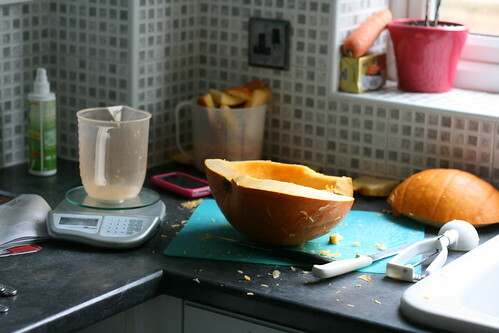 It said to use squash, but as it was the week before Halloween and there were pumpkins absolutely everywhere, I decided to use pumpkin instead. I also changed a few things around to fit what I thought would work better, worrying that I was going to ruin Sunday with a strange tasting meal. But the result was an utterly gorgeous alternative Sunday roast. It is also one of the most low-fuss recipes I’ve ever tried. I’m making a version today with mixed squash and sweet potato for our evening meal tonight, which is why I’m sharing this with you now. I know it’s probably a bit late to have it for your Sunday Dinner today, but next week, eh? 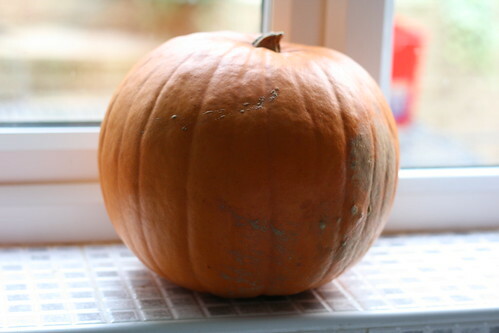 I can’t remember ever having used or carved a pumpkin before, but I did have a few presumptions about them. The first was that it would be easy to cut through them. Um, no. 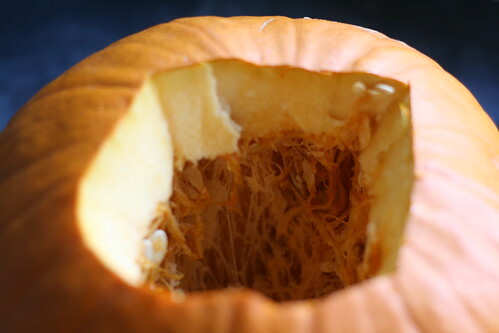 My second was that pumpkins were solid inside. Again, no. The third is that I would be able to take the flesh I needed to cook with and the shell would be left intact for carving. No, no, no, no, no. 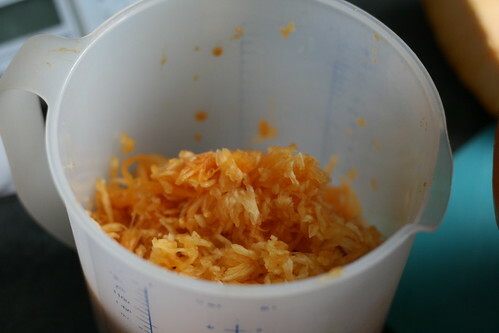 I ended up hacking the thing to pieces and cutting off chunks of flesh as I went, scooping the seeds out into a bowl. 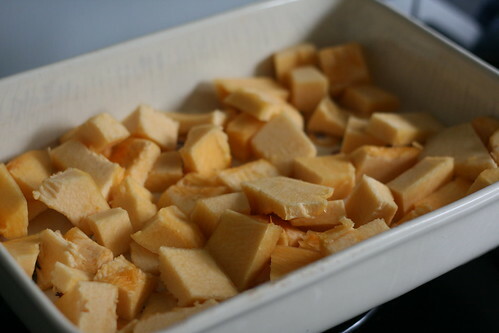 But, I ended up with a nice big roasting tray (that I had sprayed well with Fry Light) full of pumpkin flesh. Anyway. 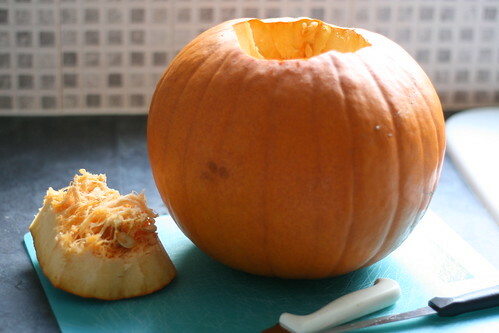 Sprinkle a tiny bit of salt over the pumpkin and prepared the paprika smeary marinade. 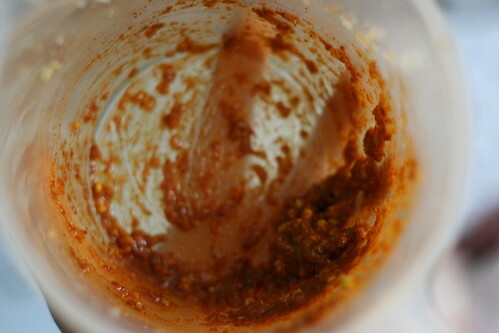 I crushed the garlic cloves and mixed with the paprika, the olive oil and the crumbled Knor stock cube. 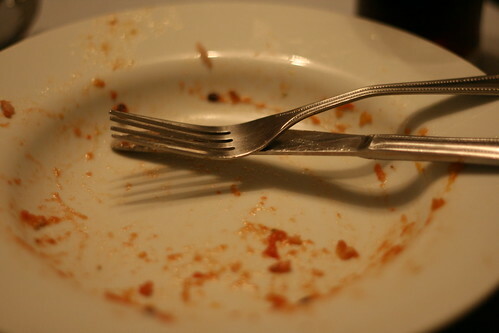 I then mashed this with a fork to get a paste. 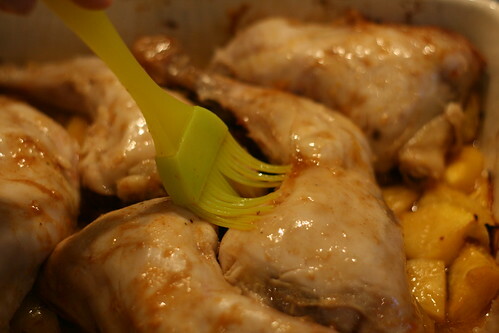 Then use the back of a teaspoon to smear this paste on the top of the chicken legs. Make sure the skin is removed. 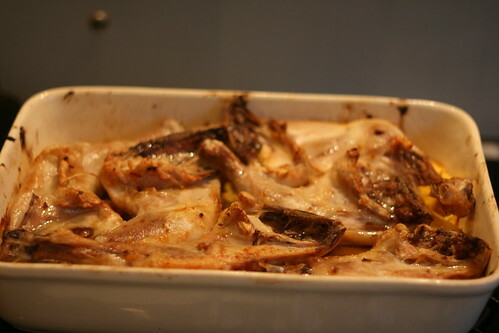 If you can’t get skinless chicken thighs, pull it off yourself. It is disgusting but the flavouring needs to go on the actual chicken. 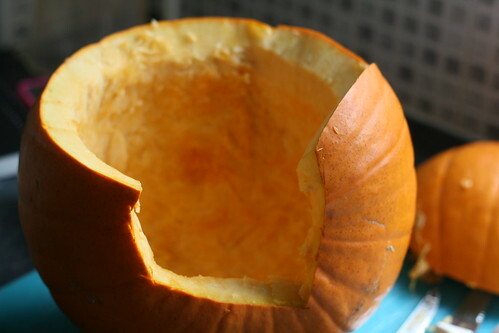 Then pop it in the roasting dish with the pumpkin. When you have smeared all of your chicken thighs, flip them over so that the paprika smush is nestled against the pumpkin. If you’re very clever/lucky, you should be able to work it so that the chicken fits together like a jigsaw on top of your roasting tray and every bit of squash is covered by the smeared chicken. Let this marinate for at least four hours, but preferably overnight. Then, about two hours before you want to serve, preheat the oven to 190°C (set a fan oven to 170°C) and cook the chicken and pumpkin for 30 minutes. 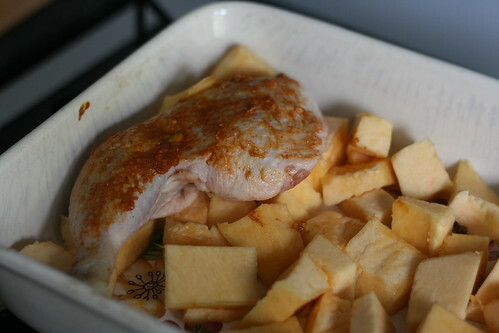 Then cook the chicken for another hour, basting in the same way with the juices every 30 minutes. 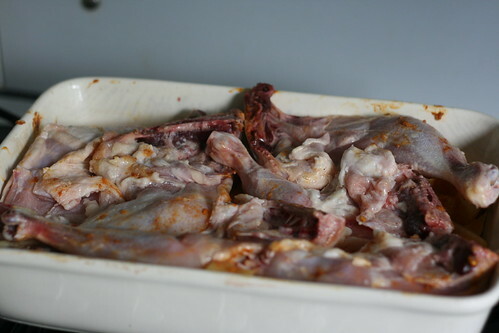 Then take the chicken out and leave it to rest for 10 minutes. 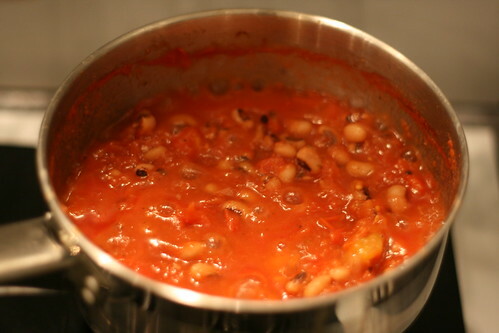 Whilst it’s resting, put the beans in the microwave for three minutes and the can of chopped tomatoes in a saucepan. When the beans are done, tip them into the pan with the tomatoes and add a good grind of black pepper. Heat through. 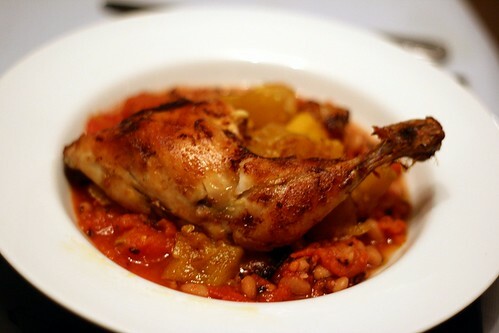 When it comes to serve, put a good spoonful of the tomatoes and beans onto a plate, top with the pumpkin and finally add the chicken on top. Voila! It smelt and looked delicious. 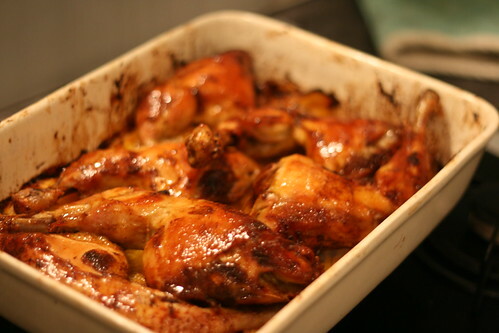 It was really moist and juicy, and the flavours just worked really well together.